Celebration Bermudagrass was developed by the renowned grass breeder Roy Riley. Celebration Bermudagrass offer specifiers, landscapers, golf course designers, sports turf managers and homeowners exceptional performance across a wide spectrum of applications. Celebration Bermudagrass requires less maintenance than other Bermudagrass varieties due to its tough runners, rhizomes and deep roots that provide excellent sod strength. This also provides improved drought tolerance than other Bermuda varieties. Celebration Bermudagrass has a dark blue-green color and has an average blade width of 1.7 mm. Celebration Bermudagrass provides a soft to touch feel and has an excellent fall color retention and spring green up rating. Celebration grows in sand, sandy, loam, clay, and muck with no issues. Celebration Bermuda has an excellent wear and injury recovery ability. Celebration Bermudagrass has a very good weed control rating and has an outstanding drought tolerance rating. 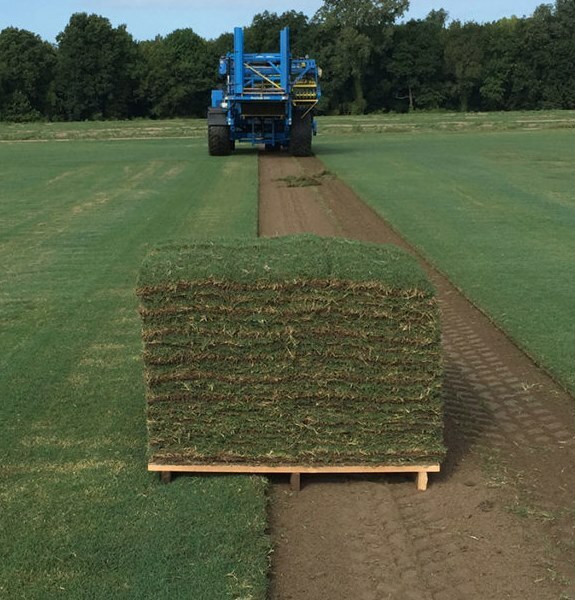 Overall Celebration Bermudagrass is a strong Bermudagrass used for high traffic area’s and sports fields, golf courses and is versatile enough to be used on your home lawn. Our Celebration Bermudagrass comes in 400 sq. ft. pallets. We have developed a stringent fungus, mildew and foreign vegetation maintenance program to ensure quality, healthy sod arrives at your home. We have a 30-day weed warranty on all of our grasses. Our Celebration Bermudagrass comes in 400 sq. ft. pallets.